Today's 1935 story starts in 1933, the year vintage collectors link inextricably to Goudey Gum, whose 240-card Big League Gum set features every star of the era--including 4 Babe Ruths--and mark a point where gum cards became both serious business and cultural touchstones. Many collectors (me included) call 1933 baseball their favorite pre-WWII set and its hand-painted photos stand out like few others. 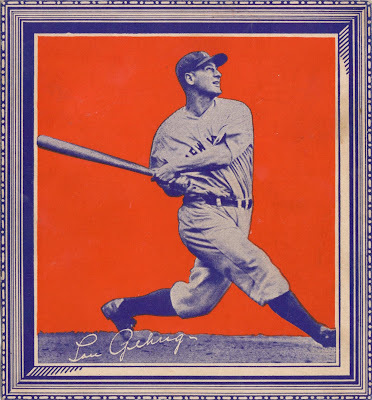 PSA's closer look at 1933 hits the set's high points, but also read their History of the Goudey Gum Company to understand why this debut looms so large. Goudey spent most of the 1930s falling from their first big hit, unable to outpace the economic realities of America's Great Depression. Everything they made afterwards trailed in set size, design quality, and collector appeal, including today's type card profile of The Knot Hole League Game, a set as obscure and bland as they come. Your eyes don't deceive you, there's no player on this card. 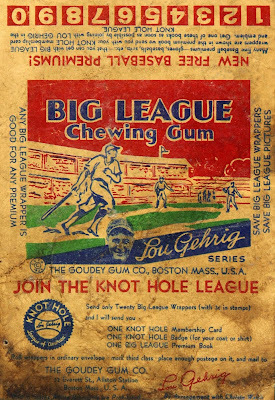 These "series of 100" Knot Hole League cards are a scorecard-style promotion linked to a Goudey collector's club (i.e., customer loyalty program) of the same name. The set's hard to complete and hard to love, but its origin helps explain how Goudey survived an otherwise terrible time to be in business. 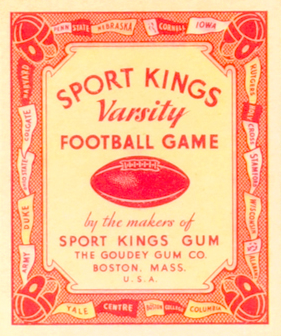 The concept began with a tie-in for their 1933 Sport Kings set called Varsity Football. Varsity Football backs list 18 colleges on framing pennants, including Centre College, my parents' alma mater (and no longer the collegiate sports power it once was). Fronts show six standard football situations with results that vary from card-to-card. Varsity game players started with a stack of face-down cards, flipped one over, and picked a "play" based on their game situation. Pick a rush before flipping this card and you'd lose 5 yards. Boooooooo. The Knot Hole League set copies this game concept for baseball, with scoring moved to the card front's 9-inning grid. Baseball varies less than football, so backs need just two results (e.g., STRIKE and WILD PITCH) and players use the one that's upright when flipped. Varsity Football deserves a separate blog post explaining how to play. 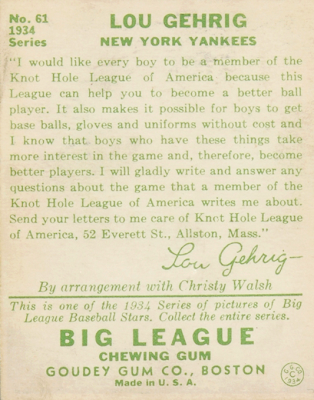 More relevant now is its marketing letter, which explains Goudey's distribution for both it and Knot Hole League cards. 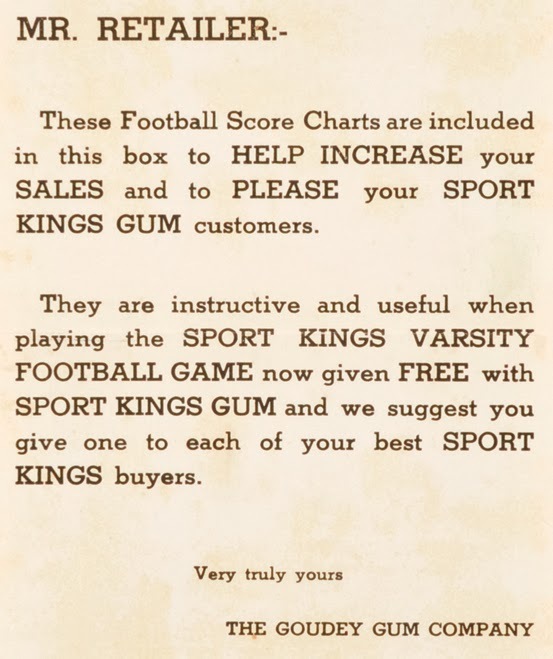 Shop instructions for Varsity Football & its "Score Charts"
...and Gehrig's own Big League Gum card, #61 in the 1934 series. 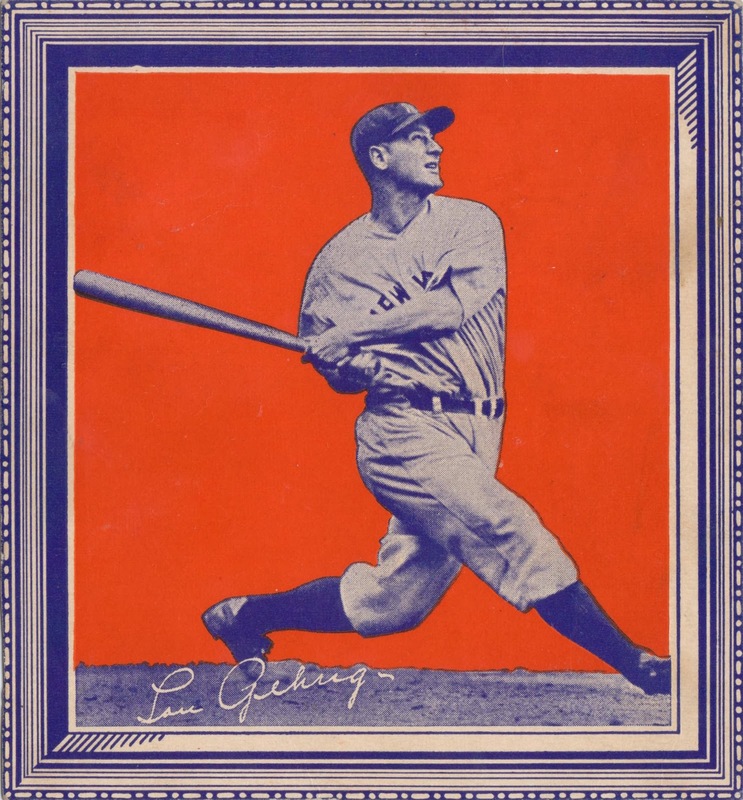 Despite Gehrig's presence, that season's first three series of Big League Gum (24 cards each, #1-72) sold poorly compared to 1933, as trading card competitors and the Great Depression squeezed Goudey from both sides. 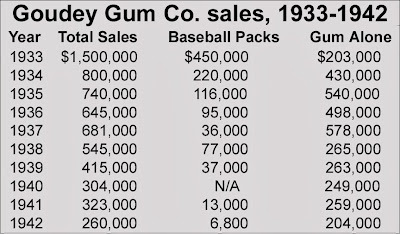 At some point, Goudey realized they stood no chance of repeating 1933's standout success and cut Big League Gum's set size by more than half, from 240 (ten 24-card series) in 1933 to just 96 (four 24-card series) in 1934. This printing sheet for 1934's fourth series, what we now call the high numbers, made several tweaks that reflected this economic reality. That red "Chuck Klein says..." tagline replaced a blue "Lou Gehrig says..." for the 12 NL players pictured #73-96. Gehrig's tagline appeared on every card up to #72--including Chuck Klein's card--but I suspect Goudey made the change in series 4 for two financial reasons. 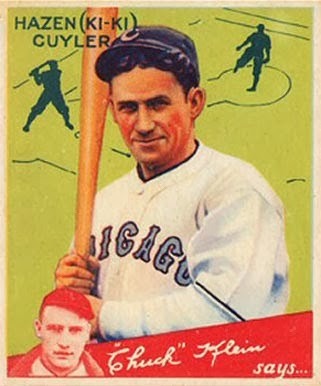 In addition, Chuck Klein was the NL's batting champion and Chicago made big news when they acquired him from Philly prior to 1934. 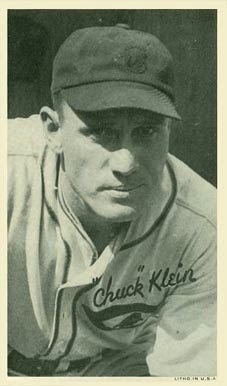 This would make Chuck more marketable in the Midwest and fans from National League cities would see Klein each time they faced the Cubs, but never Gehrig unless the World Series or All-Star Game came to town. Goudey created a handful of oversized photo Premiums in 1933 as mail-order customer incentives. 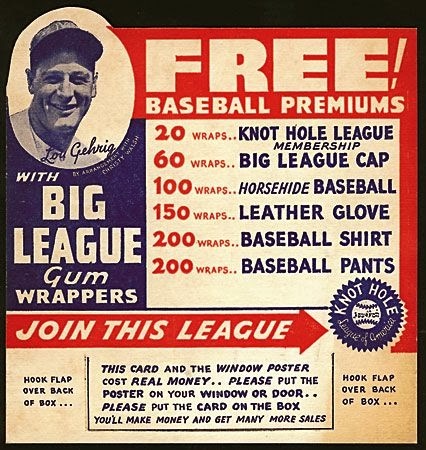 With falling card sales, however, they cut Big League Gum set sizes and expanded the cheaper-to-print Premiums. 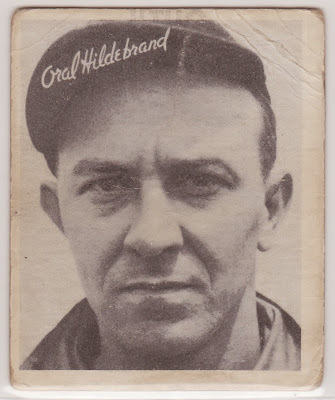 By 1936, Goudey created just 25 new cards (and tied backs to the Knot Hole game), but offered up to 200 player photos in return for Big League Gum wrappers. 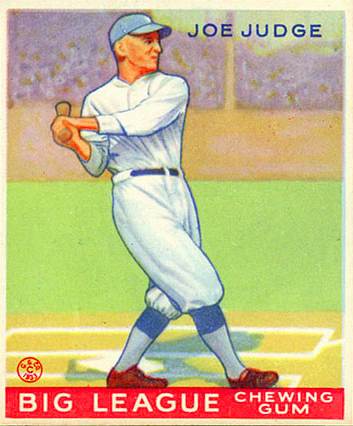 It's fiscally reasonable to see Goudey planning smaller releases throughout the mid-30s, as American struggled through the Great Depression. The Knot Hole League and in-store redemptions functioned like today's frequent-flier miles, as add-on loyalty programs they hoped would retain customers in uncertain times. Those mid-1930s baseball card doldrums might explain why another Boston-based card-and-gum company, National Chicle, declared bankruptcy in 1937. Chicle invested significant money in its Art Deco Diamond Stars and photographic Batter-Up sets, attractive sets that no doubt stole 1934-36 sales from Big League Gum, but couldn't overcome America's larger economic woes. 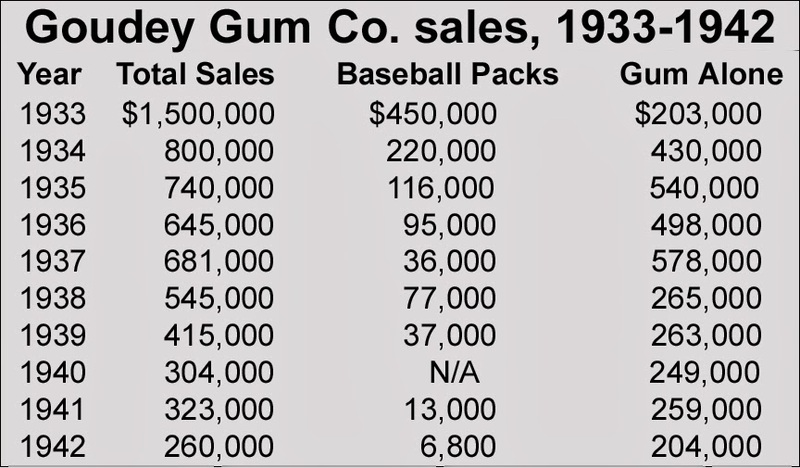 That walk through Goudey's early baseball history explains their evolving business strategy and growing need to land repeat customers via The Knot Hole League after the steep drop from 1933's Big League Gum sales. 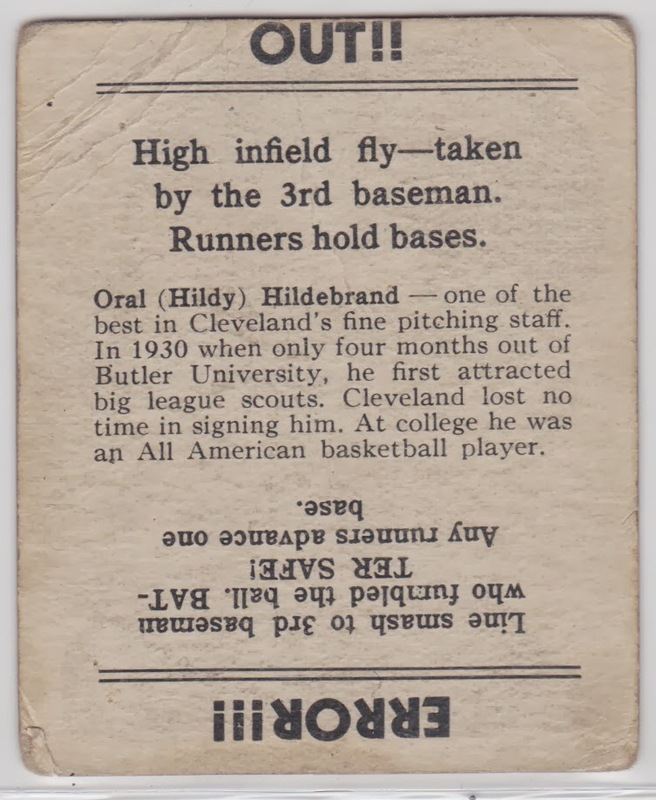 From 1935 forward, Goudey distributed their sets series-by-series, 24 cards at a time, printing more as revenue came in. Years first disappeared from Big League Gum cards (1935-) and then wrappers (1936-), supporting a "dateless marketing" that would feel alien in today's market. Once the Knot Hole card's inning grid was filled in, though, scorecards were only good for their backside game situations, so I assume kids threw them away. This would explain both their scarcity in the modern market (compared to 1936 photo cards) and why Knot Hole cards you find today aren't written on. 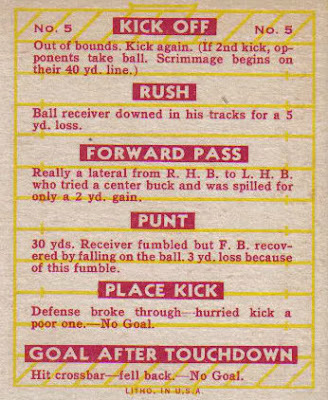 The card-flipping aspect reappeared on the backs of 1936 Big League Gum, perhaps because customers liked the game or plenty of Knot Hole League scorecards remained to be handed out at retailers. 1936 Big League Gum has 25 different fronts--all re-cropped photos from Goudey's Premiums--but each player comes with several play variations (e.g., OUT!! & ERROR!!!). Dave Weisner's pursuit of a front & back master set identified 175 total combos, implying the set used seven 5x5 sheets like the one used for 1934's 4th series, revisited below. 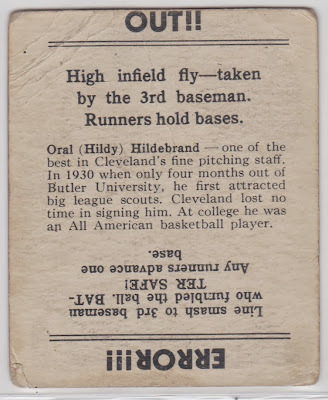 But did 1936 Goudey use 5x5? 4x6? I've since identified a 176th different front/back combo in my own collection that fills a hole in Dave's master set research. 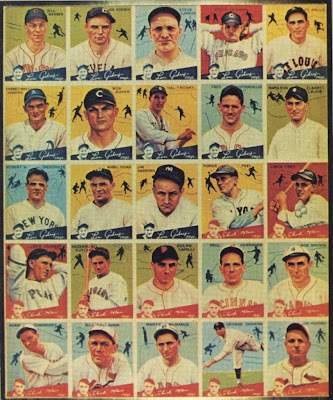 176 doesn't divide evenly into a 24-card sheet, so Goudey double-printed a few of their players on a 4x6 sheet or added at least one variation to 5x5 sheets. Unless we discover an uncut 1936 sheet, the true answer remains elusive. 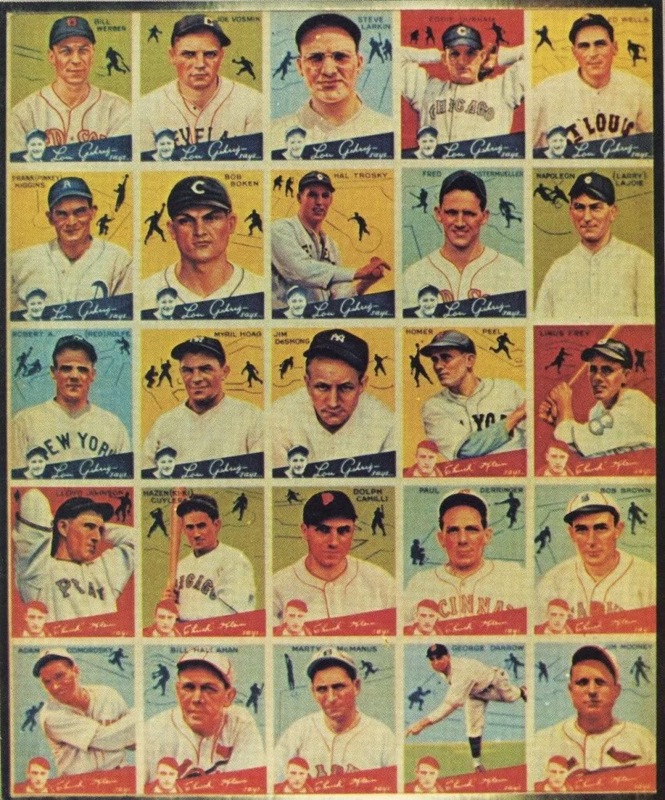 Goudey's stated Knot Hole set size ("series of 100") stopped well short at just 24 cards, telling us something about how hard the Depression hit companies from 1934-1937, when penny gum sales significantly outpaced trading cards. Knot Hole cards likely proved unpopular as a promotion and Goudey stopped printing them to save money. These days, I assume Topps sets their print run well in advance, but 1930s candy and gum makers had no such luxury. Many changed plans mid-year or simply closed up shop when cash ran out. 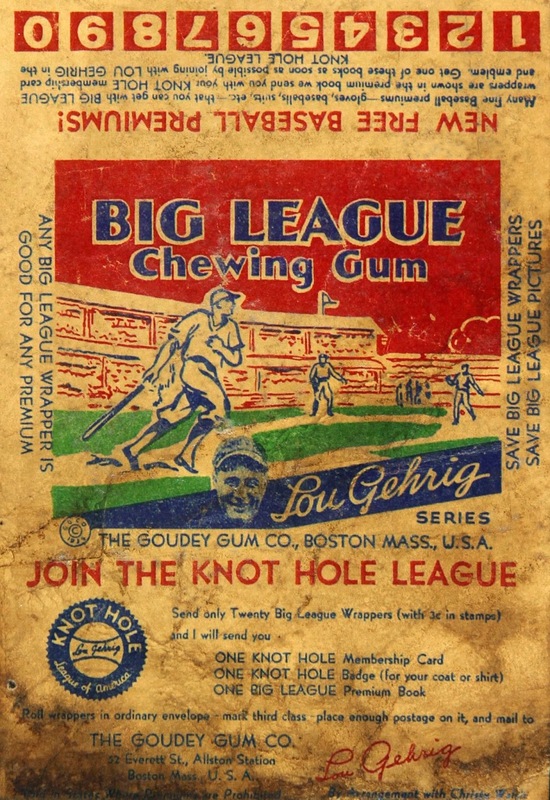 Note packs sold in 1937, 1939 & 1942, despite no new "release"
Some catalogs (and grading companies) date The Knot Hole League Game to 1937, which makes sense if you consider Goudey resold its Big League Gum packs for years after their original printing, making it easy to munge release dates. 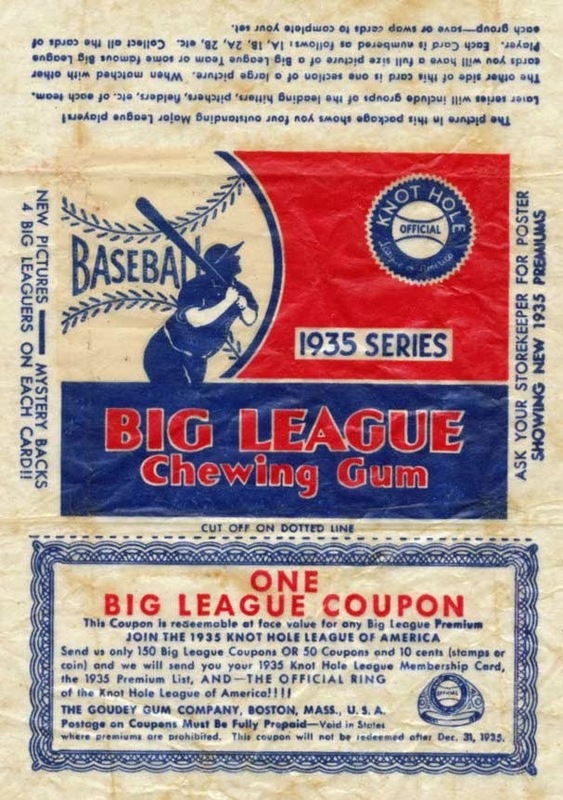 As noted above, thousands of packs sold in years they didn't create new gum sets. 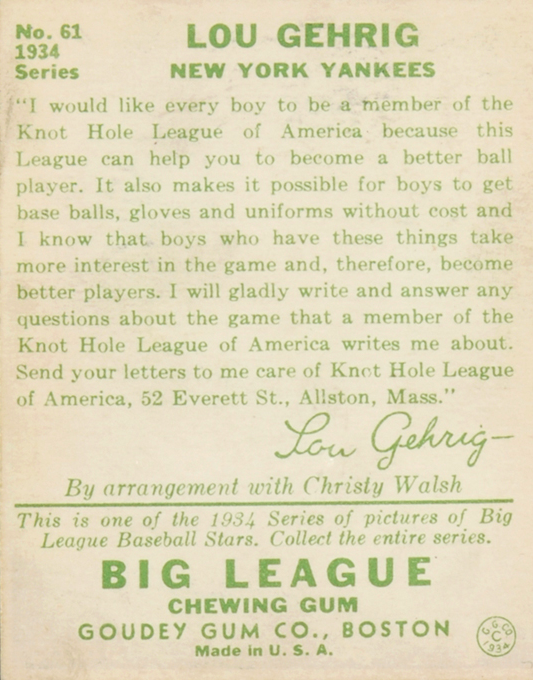 Knot Hole League card photos appear in a collection find from 1933-35 (article courtesy George Vrechek), but shopkeepers were still handing out their scorecards in 1937, so you can understand the confusion in assigning a date. 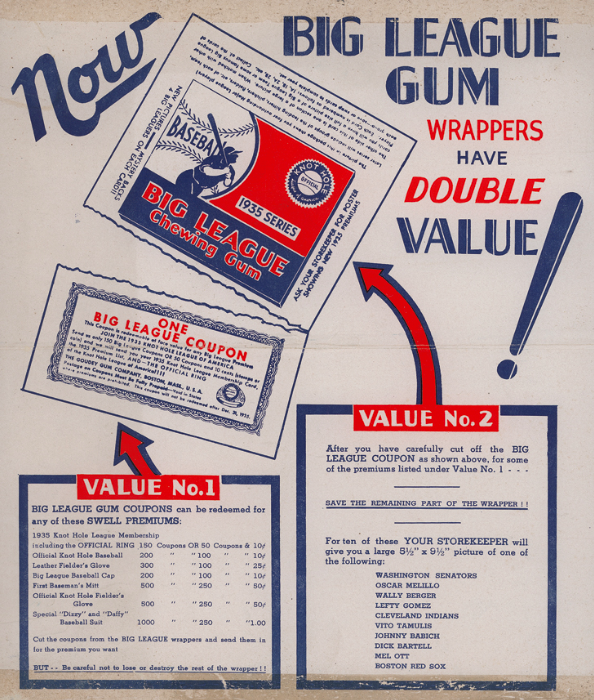 Given their ties to 1936 Big League Gum's game backs, I'm surprised no one assigned them that year. It's no accident that Goudey's Knot Hole League set connected to several other aspects of their business and competitive environment. I'll dig further into those related sets and business context in future posts. 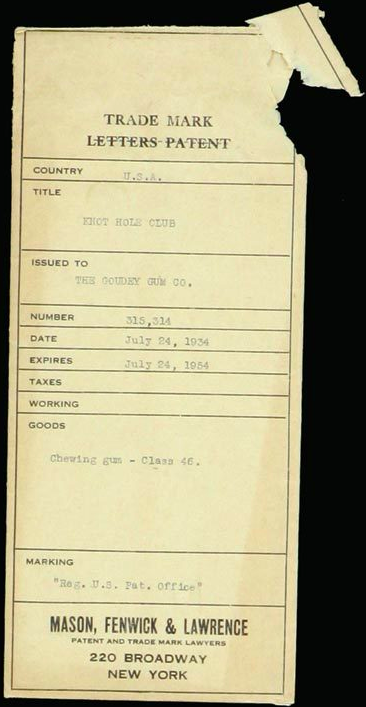 UPDATE: Goudey acquired this patent for "Knot Hole Club" (as connected to chewing gum) on July 24, 1934. It auctioned with similar company papers for $275 in 2009. Value: A complete SGC graded set of 24 Knot Hole League cards auctioned for $510 in 2008 and low-grade singles close for $5-10 each on eBay. Fakes / reprints: Haven't seen any and it'd be hard to make money faking non-player cards. Wow. That had to take a lot of time and digging. I can't imagine trying to keep a business going during The Depression, particularly one tied to non-essentials. Yeah, the basics of regular business are hard enough! 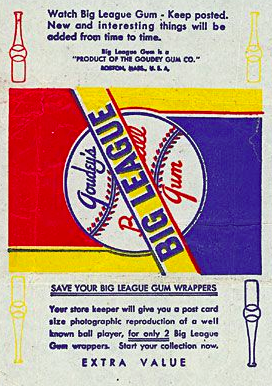 Paper rationing arguably put Goudey out of the baseball business after 1941 (and their last such set relied on rough rag paper instead of card stock), but the economics of convenience products like gum aren't a slam-dunk, either. The Cambridge (MA) historical commission has an on-line Candy Land tour map that describes their local companies and products. Tootsie Rolls still make a considerable amount of candy here. Really fun read. I knew very little about the Knot Hole League before this well researched post. The one thing I'll call out is that Gehrig did make it into the 1936 WWG set, which I've always assumed was part of the Goudey family.